Get a new pool house installed in time for your Memorial Day BBQ. Browse our In-Stock Options! Custom buildings designed for you. Express your style. Match your landscape. 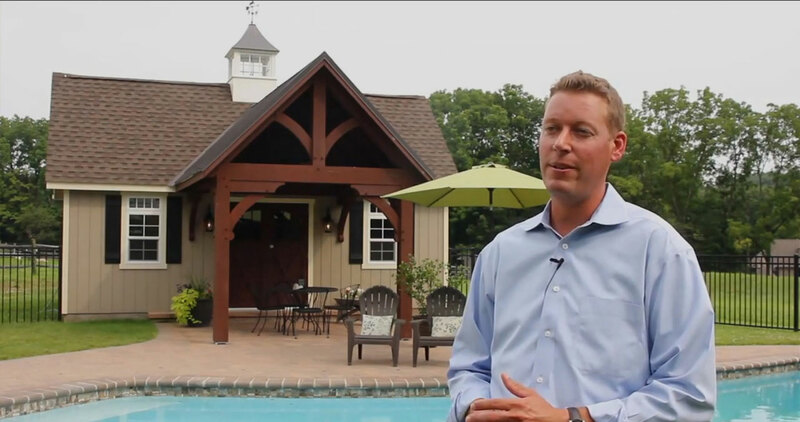 Get your free pool house quote. With a structure that's just your style. Get your free pavilion quote. Hear how customers are loving their new space. Storage solutions without the hassle. Our staff will guide you along each step. Get your free garage quote. Hear how easy the process is. Add the most value to your home with top-notch workmanship. Get your free shed quote. Our customers say our work is top-notch. See why . . . So what do you need more of? Storage space? Outdoor living space? Work space? Whether your new building is a gorgeous poolside pavilion or pool house, or simply a new garage or storage shed, everything we build is handcrafted by Amish craftsman using a range of traditional building techniques and modern materials. The result is a unique structure that you can truly call your own, build by a community with a long-standing dedication to the highest possible craftsmanship. We'll work with you through the design process to ensure you end up with the building of your dreams. Our pool house has added a new dimension to our backyard, by adding additional outdoor living space for the whole family. We have really enjoyed sitting in the shade and watching a show or video by the pool and are very happy with it. The price was right, and we are telling a lot of people about you. We enjoy having people over and they have fun with our pool house. It ties in really nicely with our backyard and landscaping, and by adding additional space it created a new room for the whole family. It was so nice to have our pool house prebuilt and delivered, that way we just had to hook up the electric and that was all. This was key for us and Eric (the delivery guy) was awesome! Another thing that was great was how easy it was to order, with a few phone calls to order, a few to tweak some things and that was it, Merv did a great job helping us. ... all chosen by you to fit your lifestyle and crafted at our shop on our family farm. Homestead Structures manufactures and sells quality pool & backyard pavilions, pool houses & cabanas, custom prefab garages, garden sheds, Amish storage sheds, custom sheds, and much more.